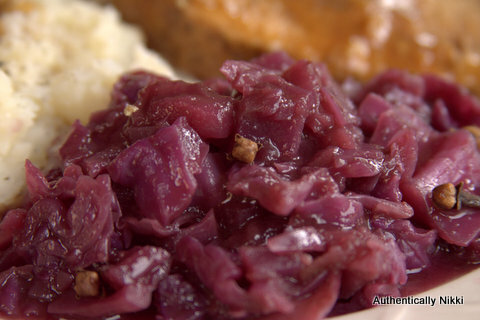 Red cabbage has always been one of my favorite German side dishes. When dining at German restaurants I often decide what entree to order based solely on the fact that red cabbage is listed as one of the sides. I love the sweet and sour flavor with a hint of warmth from the cloves and cinnamon. My Oma also makes wonderful red cabbage. She prefers to use duck or goose fat for sauteing the vegetables which is wonderfully decadent. However, it is not a very practical ingredient to list as I don’t know many people who keep either on hand. She also uses white sugar and caramelizes it in the hot fat before adding the onions and apples. I use brown sugar which gives the same flavor and lets me skip a step. Traditionally red currant jelly is stirred into the dish at the end of cooking to give the cabbage a nice glossy finish and add another layer of flavor. You can substitute with plum, black currant or lingonberry jam or leave it out all together. If you omit the jelly, you may need to slightly increase the amount of sugar. Red cabbage is the perfect side dish to accompany a pork roast. In a large (12- to 14- inch) skillet or braising pan, melt the butter over medium heat. Add the onion and apple and saute until soft and beginning to brown, about 10 minutes. Add the cabbage and cover until the cabbage wilts, about 10 minutes, stirring often. Sprinkle one tablespoon of the flour over the cabbage and stir until no flour remains visible. Repeat with the second tablespoon of flour. Add the red wine vinegar, red wine, beef broth, bay leaves, salt, cinnamon stick, ground cloves and brown sugar. Stir well. Cover and simmer over low heat for 30-40 minutes, stirring occasionally, until the cabbage is soft. If using, stir in the red currant jelly and taste for seasoning. Discard the bay leaves and cinnamon stick before serving. This entry was posted in Side Dishes and tagged cabbage, German by authenticallynikki. Bookmark the permalink. whay? No duck fat at your house?